We take on any kind of demolition job – residential, industrial, or commercial demolition. We continually update our skills and equipments to offer a diverse range of demolition services to our customers satisfaction. Making our customers happy and content with our services is what we strive to do with Deconstruction Pro. Call us today to geta quote or if you have any questions on our services. 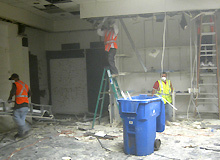 We value your time and we provide our commercial demolition services with YOU in mind. We know that any kind of construction, renovation or demolition is important to you. That is why we have the best estimators to deal with any of your demolition issues. We are reachable by phone, web or e-mail. We are fully accredited to provide demolition services as a licensed and insured demolition contractor, ensuring that we protect both you and our employees at every demolition job we undertake. We observe the highest standards of safety and cleanliness in all our commercial demolition projects. We clean up after every job and leave your property neat and tidy upon job completion. We use our knowledge and expertise to get the job done quickly, efficiently, correctly and of superb quality. Our company is fully equipped with a bobcat and excavator and several large dump trucks to guarantee problem-free demolition. You pay only for the actual demolition services, and not for the use of these resources. Our demolition team is all fully-trained to operate all demolition equipments and vehicles. We are serious in our advocacy to protect and preserve the environment. We recycle, recycle, and recycle! More than 75% of construction debris from our residential and commercial demolition projects is recycled. Construction debris such as concrete and asphalt breakups are recyclable materials that we take to recycling facilities. We consider it our moral obligation to save the environment in every way we can.